The band that plays together stays together…known as one of the first country bands to play on every one of their studio projects, Diamond Rio made country music history when their first Arista Nashville single, “Meet In The Middle” landed them in the #1 spot. Now, 25 years later, Diamond Rio, is releasing “I Made It”, their tenth studio album. The title track was co-written by the band’s lead guitarist Jimmy Olander and features 11 new songs. Produced by Olander and Michael D Clute, “I Made It”, is available today Friday, September 18 at iTunes and through Rio Hot Records at diamondrio.com. “I Made It” is the follow-up to their 2014 first-ever live album release, “Diamond Rio Live”. 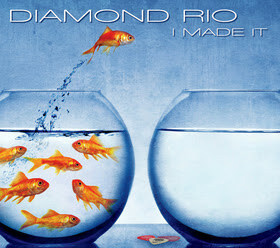 And to celebrate the release for a limited time, fans can receive a FREE MP3 of the title track, “I Made It” by visiting www.diamondrio.com. We were fortunate to not be rushed with this project,” shares Gene Johnson. “Over the past few years we’ve taken the time to work on several projects that were on our bucket list; a Christmas album and our first-ever Christian and live albums.” Dan Truman further explains, “Instead of cutting the album in a 2 week period, or 2 month period we’d cut a few songs every year. What that allowed us to do is be very selective about what we cut and to take the time to live with these songs, making the proper edits and decisions.” Marty Roe and Dana Williams both agree that, collectively, this may be the best group of songs the band has ever recorded. To find out more about Diamond Rio go to DiamondRio.com: or follow him on TWITTER, INSTAGRAM,FACEBOOK or YOUTUBE.